Too big for WordPress, the workbook, crated in a Google Doc box but available to Excel users via a CSV download, is yours by clicking the above page’s Get the data link. 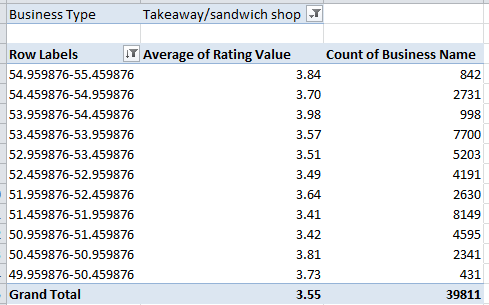 Note the disconcertingly low average for takeaway/sandwich shop (will you ever look at that ham and cheese the same way again? ), bookended with the hearteningly salubrious 4.62 accorded Hospital/Childcare/Caring Premises, and the School/college/university’s head-of-the-class 4.72. Row Labels: Latitude (grouped by say, .5. You’ll also want to filter the (blank) output here. (I’ve sorted the grouped latitudes from highest to lowest, or, given the text-formatted character of the grouped latitudes, Z to A, to reflect the UK’s largely north-to-south gestalt. Note too that over 20,000 records have absconded with their latitudes and longitudes, but even that that formidable blank spot accounts for fewer than 6% of all records). Some areal variation does obtain above, and we can note that London features in the 51.459876-51.959876 swath, the lowest-evaluated geographical band. 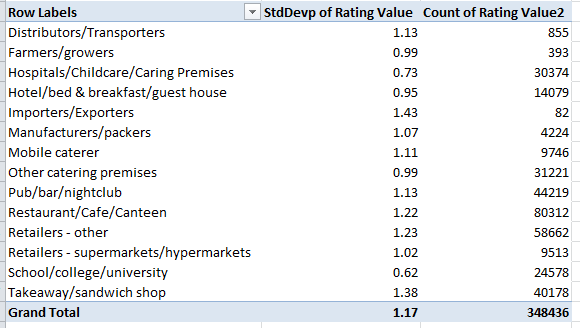 The correlation between average rating and numbers of businesses counted per grouping: -.787, a result the Statwing web site pronounces Clearly Significant. Is there something about the urban tableau that depresses quality of service? 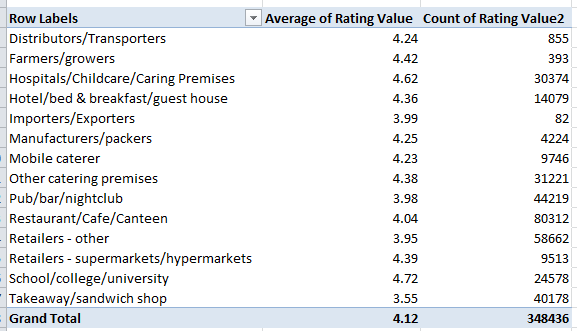 Again the London-centric tranche bottoms out, vying with the southernmost 49.95 rung for lowest rating average. 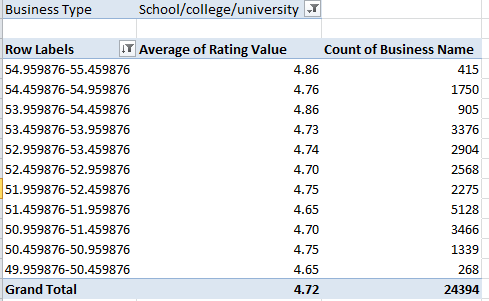 The Rating/number of establishment correlation here comes to -.53, an association Statwing finds Not quite significant; nevertheless, the site considers sample size (that is the eleven latitude cases), without reckoning with the size of each rather considerable per-case business count. In any case, more possibilities beckon. Hope to plumb some more next time.